This 6-Column Half Height Wine Rack Kit holds up to 60 wine bottles, from standard Bordeaux size to Pinot Noir and Champagne size. can these wine racks be stacked on top of each other? BEST ANSWER: Hi. On one side I have the glass holder stacked on top and on another one I have the same piece on top. Seems to works well. Good luck. BEST ANSWER: The N'FINITY Wine Rack Kit - 6 Column Half Height does come with two wall brackets. I have attached the manual for your convenience. If you look at the product manual provided on the Wine Enthusiast site you'll see that it comes with a wall bracket. We did not use this, rather left the unit free standing, so can't attest to how well it works. Happy with the rest of the unit though. It was the only rack I found that looks nice enough for a dining room - the finish is furniture-grade and the design nice. Assembly took about 2.5 hours as some of the pre-drilled holes were too small for the screws. Once done, it looks good. The top shelf should have been included with the unit instead of being sold separately as it looks incomplete without it. Went together a lot easier than N'FINITY Wine Rack Kit - 3 Column with Display. Just make sure you have a power drill to screw in the screw, use of a screw driver will increase assembly time hours. This is a nice wine rack once you figure out the poorly written instructions. Pre- drilled holes do not line up, and the corners are not perfectly flush. Once assembled it looks pretty good.Lots of patience and wine are helpful during assembly! Love the wine rack and the idea, but when put to gather with the other pieces (arch and two 3 column racks) the upper molding isn’t straight no matter how much work you put into it, it doesn’t look as professional as one would like. But, it stores the wine great! Delivery was prompt, but had one of the wooden rack rails was broken. I used wood glue to fix it and after assembly that area is covered by the tabletop. Glad we purchased the tabletop. 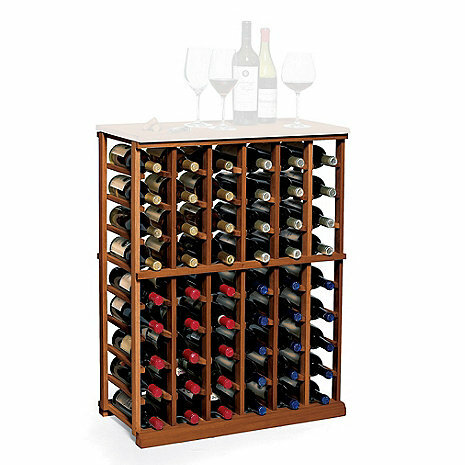 It is a very nice tabletop and would definitedly recommend it when buying the wine rack. Not all screw holes are aligned. Therefore, once fully assembled, not all edges are perfectly aligned. While this is minor, I wish the edges were better aligned. Used as storage of pinot/chardonnay sized bottles that won't fit in our wine storage cabinet. The table top was right on time. Te actual rack was three weeks late due to back order. That was frustrating, but it was Christmas time. The package was in one piece and no damage. Easy to assemble and very good quality. This one is the 8th one in my cellar. Some assembly required. Fortunately I had a handy man available to assemble. It's like a erector set. Also comes with brackets to attach to the wall. If this was not being gifted to someone the day after I received it, I would have stopped assembling it half way through and sent it back. The majority of the screw holes were out of alignment, and one peice didn't even have holes drilled in it. What should have taken no more than an hour to assemble, ended up taking five hours, and there were a couple of screws I gave up on, just because the prefab holes were off by enough that the screws wouldn't go in, but putting a drill to it would essentially make the holes bigger, and then be just as useless. If you look at it from a distance it appears nice, but up close you can see how the various pieces are off. Definitely not worth what I paid. Very Nice and looks good. Easy to assemble. Several people said had to drill new holes. Did not find this true. Visitors have commented how nice it looks. Great finish, sturdy, high quality, easy to assemble. It was easy for my son-in-law to put together; I like how it looks; holds plenty of wine bottles. Love this wine rack fits perfects with our design. Used your product to rack this years muscadine wine, worked very well and the finish on the rack is beautiful.Was not disappointed once I received the product.Assembly was not difficult, took about 25 minutes;however, if I had not read reviews I would not have known that the top was separate and would have been disappointed upon arrival. Overall great product- would recommend to a friend. This wine rack looks quite nice! Assembly was not difficult until the last few steps. A couple of holes needed to be drilled for the last two pieces. Definitely good value for the money!! At this price, I expected high quality. Lack of pilot holes on one piece, too small holes which resulted in wood splitting in places, holes in the wrong place--all of these made assembly difficult. The wood was warped and the joints did not fit tightly. All of this made the overall look of the finished rack far below what I expected for the price. It fit a specific size we needed and the wood quality is decent. However the construction is obviously mass produced and not in an area that has high quality control. Mostly held together with Brad nails and probably a little glue. Some of the wood was splitting as well. We need another rack for a different area but won't order this brand again. Product was cheaply made for the cost. Color shown on website is much darker than it actually is. Returning this! The predrilled holes were not predrilled, even with power tools I could not assemble!